A photo of D/S Taborfjell from http://warsailors.com/singleships/taborfjell.html, from Arve Wiborg. The Norwegian steam ship Taborfjell was 1,339 gross tons and could carry 2,600 tons of dry cargo. She was built in Oslo Norway in 1938 by Nylands Mek. Verksted. Her owners in April 1942 were A/S Rudolf and managers were Olsen & Ugelstad of Oslo, who in turn chartered the ship to the Nortraships, or Norwegian Shipping and Trade Mission in New York. At the time of her final voyage her master was Captain Erling Nilsen, age 32. Below him were 19 mariners, all of them Norwegian except for William A. Hood and George Michael Parsons, age 18, both of Britain (one of them from British Honduras), as well as Thomas J. Berrigan, a 29-year-old ordinary seaman from Canada. Between 1940 and mid 1942 most of the ship’s voyages were in the UK and Europe, with some trips to Montreal, Halifax, Sydney, St. John’s, and Quebec in Canada. 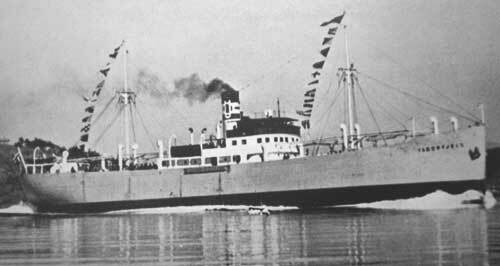 In January 1942 the ship traded several times with Manzanillo in Cuba. On April 17th she left New Orleans for Matanzas (according to Arnold Hague and warsailors.com), and left that port on the 22nd with 2,320 tons of sugar in roughly 16,000 bags. She is also said to have stopped in Havana on the 23rd of April, on a draft of 17 feet forward and 18 feet aft. Her destination was New York Harbor, which she reached on the 28th of April. Taborfjell left the following day on its final voyage. The ship proceeded, presumably via Long Island Sound, through the Cape Cod Canal, which it transited on the 29th of April, bound for Montreal, on the St. Lawrence River. That day at about 3 pm the radio operator reported that they received a “CQ” (definition unknown) report relaying the sighting of an enemy submarine in roughly the position they were heading to. By the following day the ship was roughly 95 nautical miles east of the north tip of Cape Cod, and 125 nautical miles southwest of Cape Sable, on the southwest cape of Nova Scotia. There were two lookouts, one on the bow, the other on the bridge. The radio had not been used since transiting the canal. The ship was armed with a 3-inch gun mounted far aft, and five machine guns: a pair of Hotchkiss, a Marlin, and two Lewis type, as well as a Colt 50-milimeter pistol. Within between one and two minutes the ship sank by the stern, with its bow sticking out at an angle of 60 degrees. After all, its cargo holds were filled to the brim. There was no time for the sailors aboard to send an SOS or SSS message, launch a boat, or fire its guns in retort. The gaping hole rent in the starboard side extended upwards to the deck and allowed water to fill the ship with stunning speed against which the men below were helpless to flee. Radio Operator Olaf Alfsen was one of the lucky ones. He managed to run from his cabin, ran to the radio shack which was out of power, then leapt overboard from the bridge. Swimming around for some 20 minutes, he sought a lifeboat but never found one. Rather he found a life raft which popped free. He was joined by Second Officer Erling Arnesen. Together they found the Third Engineer Officer Ole Karlsen Svartangen floating in the water. Unusually for such a remote sinking in ideal conditions, Heinicke preferred not to interact with the three survivors on the raft, alongside whom he motored. The Norwegians estimated the sub was 900 to 1,000 tons, then after just a few minutes it submerged and motored off – they did not ascertain in what direction. For over 22 hours the three men floated around in the general vicinity of the sinking. Then, in another stroke of luck, at 11:30 at night on the very same day they were spotted by a British submarine numbered HMS P-552. Until 10 days before the submarined had been known as USS-1 until transferred to the Royal Navy in New London, Connecticut. Her commander at the time was Lieutenant Anthony Robert Daniell. The British submarine spent two hours searching – in vain – for any survivors amongst the 17 remaining officers and men of the Taborfjell. On the 7th of May they diverted to St. John’s Newfoundland to drop off the merchant survivors ashore. They arrived in New York on the 24th of May. The men were interviewed by Lieutenant (jg) R. D. Warden, Jr., USNR on June 30, 1942 in New York. The sub arrived in the UK in July, but was inefficient and was scrapped in Durban, South Africa in 1946.